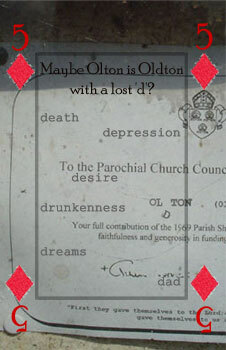 I have been told now of two Oultons in East Anglia, and one Olton in the Midlands. Sibyl associates the latter with mental illness and depression, which my father suffered from acutely. Could a town suffer from mass depression, as once a town in Tanganyika suffered from mass hysteria incapacitating the citizens with laughter and tears for several months? Certainly you wouldn't hang around in such a place for long, for fear of becoming infected. Paul associates the same place with lawn bowls and a pub. My dad loved both croquet and snooker, so one assumes he would have turned to bowls with alacrity if he'd lived longer. He always loved to drink, though not that often in pubs.